Onyx aids with emotional and physical strength during times of stress or grief. 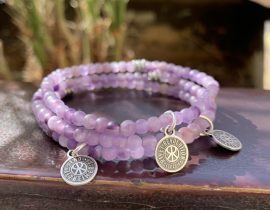 Lavender Amethyst is a calming stone that promotes healing, balance and peace. 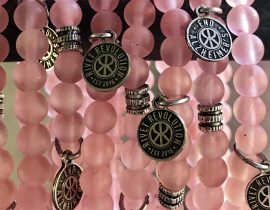 Our 4MOM Revolution Bands feature a 6mm gemstone bead. 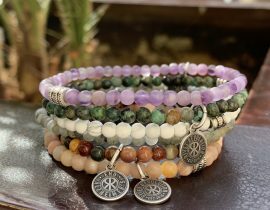 Each stretch bracelet is unique with subtle variations in color, texture and size of the gemstone beads. Every baseball game Braden Bishop plays, he plays for his mom. Literally: He has been writing “4MOM” on his left forearm in black sharpie since a practice game at the University of Washington in 2014, shortly after his mom, Suzy’s diagnosis, of early-onset Alzheimer’s. It became a pregame routine that stuck. 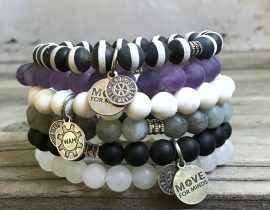 10% of the sale from every 4MOM Revolution Band sold will be donated to Braden Bishop’s 4MOM Charity, dedicated to helping people and families with Alzheimer’s/Dementia. 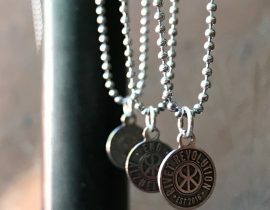 Customize your Rivet Revolution bracelet (or Necklace) with a 6mm Swarovski Crystal Charm. Choose your birthstone, honor a loved one with their birthstone or just choose a crystal that makes you happy! Each crystal charm is wire wrapped and finished with a petite flat cap. 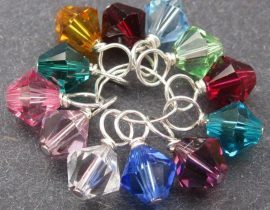 + We recommend only one Crystal Charm per bracelet so the charms dangle happy and free. Our Necklaces can handle many charms!! + Buying more than one RR Bracelet/Necklace + Crystal Charm? The more the merrier! 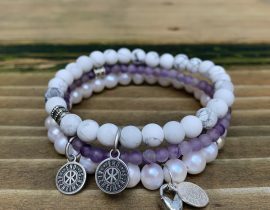 Please make a note in the checkout field “Order Notes” so we match the correct Crystal with the correct RR Bracelet or Necklace! 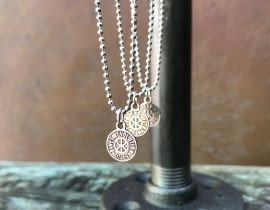 + Don’t forget to add a Rivet Revolution bracelet or necklace to your cart for your charm to have a home!! A barely there sterling silver ball chain necklace with our signature 10mm Rivet Revolution charm. Perfect for everyday and for layering with other necklaces – 18″ in length. 10% of the sale from every Ally will be donated to the fight to end Alzheimer’s through our partner charities. 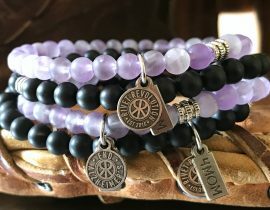 10% of the sale from every Amethyst Revolution Band sold will be donated to the fight to end Alzheimer’s through our partner charities. 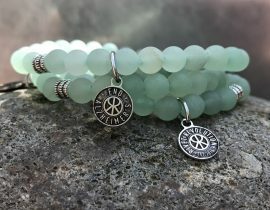 10% of the sale from every Aventurine Revolution Band sold will be donated to the fight to end Alzheimer’s through our partner charities. Cherry Quartz is good for concentration, courage and confidence. 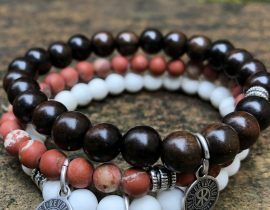 Our Cherry Quartz Revolution Band features a 6mm gemstone bead. 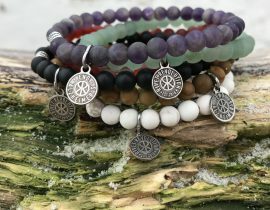 Each stretch bracelet is unique with subtle variations in color, texture and size of the gemstone beads. Quantities are limited so when they’re gone they they’re gone. The Cherry Quartz Limited Edition was designed in honor of our dear friend Chloe. 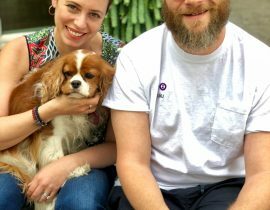 Chloe’s father suffers from early onset Alzheimers. She is our youngest Revolutionary and is very special to the Rivet Revolution Team. You can read Chloe’s blog here. 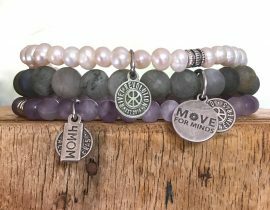 10% of the sale from every Cherry Quartz Revolution Band will be donated to the fight to end Alzheimer’s through our partner charities. Citrine Agate increases your energy and gives you inspiration to pick up the broken pieces & start again. 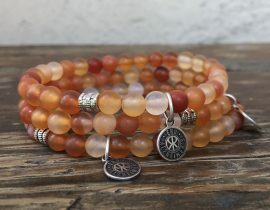 Our Citrine Agate Revolution Band features a 6mm gemstone bead. 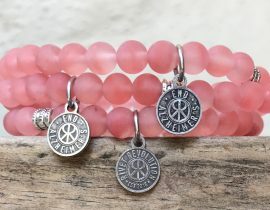 Each stretch bracelet is unique with subtle variations in color, texture and size of the gemstone beads. Quantities are limited so when they’re gone they they’re gone. 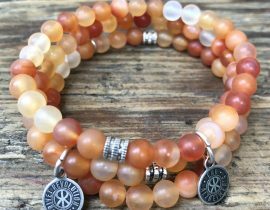 10% of the sale from every Citrine Agate Revolution Band sold will be donated to the fight to end Alzheimer’s through our partner charities. Freshwater Pearls ground and center you no matter how chaotic your world gets. 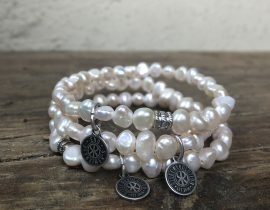 Our Freshwater Pearl Revolution Bands feature 6mm freshwater pearls. Freshwater Pearls, by their nature, are unique with subtle variations in size. Quantities are limited so when they’re gone they’re gone. 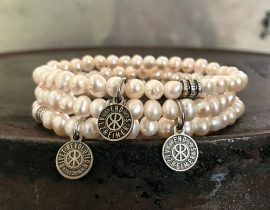 10% of the sale from every Freshwater Pearl will be donated to the fight to end Alzheimer’s through our partner charities. 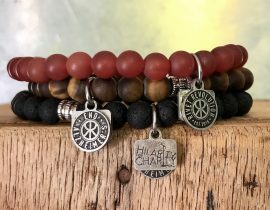 10% of the sale from every Hilarity for Charity Revolution Band sold will be donated to Seth & Lauren Miller Rogen’s Hilarity for Charity to raise awareness, inspire change, and accelerate progress in Alzheimer’s care, research, and support through the engagement of millennials. 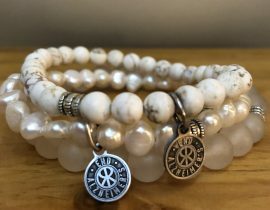 10% of the sale from every Howlite Revolution Band sold will be donated to the fight to end Alzheimer’s through our partner charities. Pearls promote inner wisdom, charity and generosity. Our Ivory Pearl Revolution Band features 5mm pearls (slightly smaller than our classic Revolution Band gemstones). Quantities are limited so when they’re gone they’re gone. 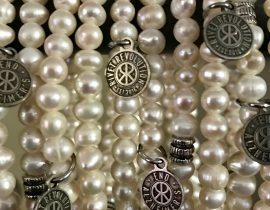 10% of the sale from every Ivory Pearl will be donated to the fight to end Alzheimer’s through our partner charities. 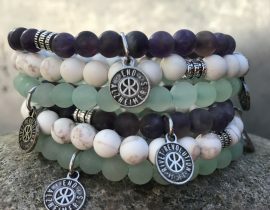 10% of the sale from every Jasper Revolution Band sold will be donated to the fight to end Alzheimer’s through our partner charities. 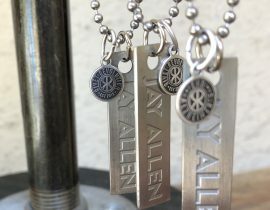 Designed in collaboration with with our dear friend and country artist, Jay Allen, this 30″ stainless steel ball chain necklace features a JAY ALLEN logo tag as well as our classic Rivet Revolution 2-sided charm. Jay Allen made headlines all over the country when he went viral singing a very special song written for his mother who suffers from Early Onset Alzheimer’s. Jay’s hope is that his song, Blank Stares, will bring hope to as many people as possible. 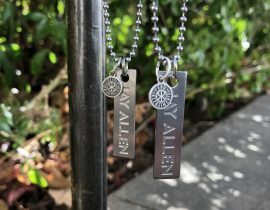 10% of the sale from every Jay Allen Necklace will be donated to the fight to end Alzheimer’s through our partner charity, Part the Cloud. Onyx aids with emotional and physical strength during times of stress or grief. Our Onyx Revolution Band features a 6mm gemstone bead. 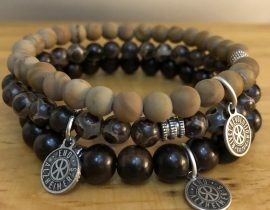 Each stretch bracelet is unique with subtle variations in color, texture and size of the gemstone beads. 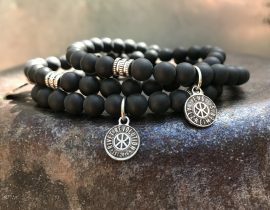 10% of the sale from every Onyx Revolution Band sold will be donated to the fight to end Alzheimer’s through our partner charities. Pearls promote inner wisdom, charity and generosity. 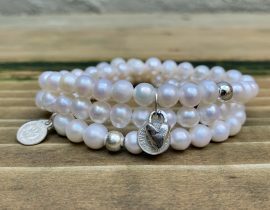 Our Limited Edition Part the Cloud Ivory Pearl Revolution Band features 7mm pearls, a sterling silver Rivet Revolution charm and a sterling silver handcast artisan heart charm. Quantities are limited so when they’re gone they’re gone. 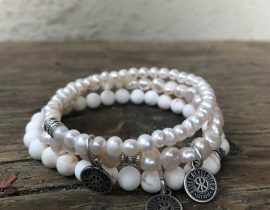 Each stretch bracelet is unique with subtle variations in color, texture and size of the pearls. 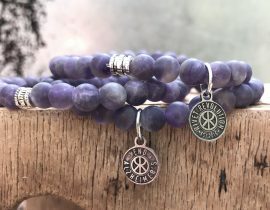 10% of the sale from every Part the Cloud Revolution Band will be donated to Part the Cloud to help support some of the most innovative research in Alzheimer’s prevention. Pyrite promotes confidence, persistence and the flow of ideas. 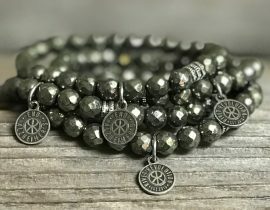 Our Pyrite Revolution Band features a 6mm gemstone bead. 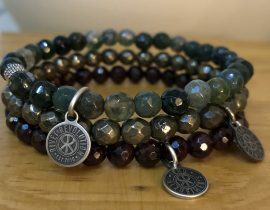 Each stretch bracelet is unique with subtle variations in color, texture and size of the gemstone beads. Quantities are limited so when they’re gone they they’re gone. 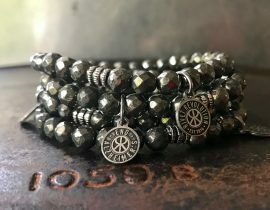 10% of the sale from every Pyrite Revolution Band sold will be donated to the fight to end Alzheimer’s through our partner charities. 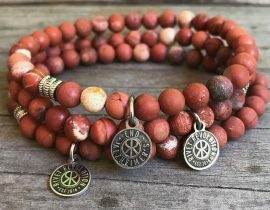 Red Lace Jasper helps you tackle new pursuits with creativity. 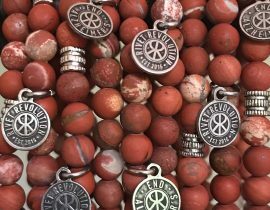 Our Red Lace Jasper Revolution Band features a 6mm gemstone bead. 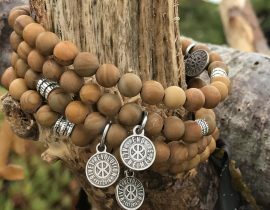 Each stretch bracelet is unique with subtle variations in color, texture and size of the gemstone beads. Quantities are limited so when they’re gone they they’re gone. 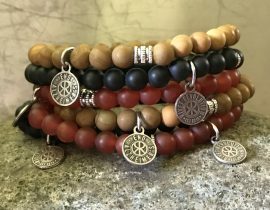 10% of the sale from every Red Lace Jasper Revolution Band sold will be donated to support the millions of people fight who are affected by Alzheimer’s through our partner charities. 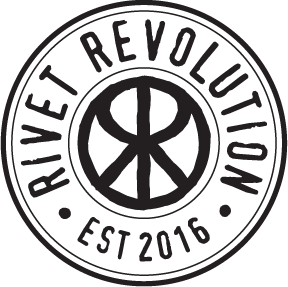 Our Revolution Babies are a great addition to your Rivet Revolution Collection. 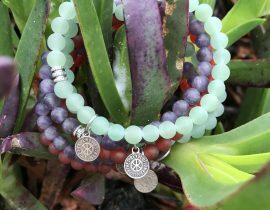 Each baby features a 4mm gemstone bead. 10% of the sale from every Revolution Baby sold will be donated to the fight to end Alzheimer’s through our partner charities. 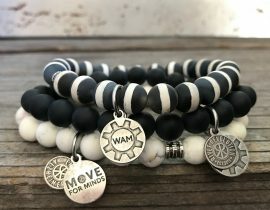 The WAM Revolution Bands, designed in collaboration with Maria Shriver and the Women’s Alzheimer’s Movement, feature an 8mm gemstone bead. Maria Shriver and WAM are the proud sponsors of Move for Minds, an annual fundraising event to ignite us to get moving and make our cognitive health a priority! Banded Agate is used for inward meditation and reflection. 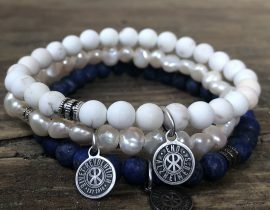 Howlite relieves stress and calms an overactive mind. Onyx aids with emotional and physical strength during times of stress or grief. Amethyst is a calming stone that promotes healing, balance and peace. Labradorite is excellent for awakening one’s own awareness of inner spirit and intuition. 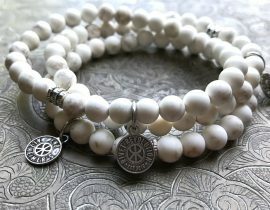 White Jade protects the wearer from negative energy and brings peace and harmony. 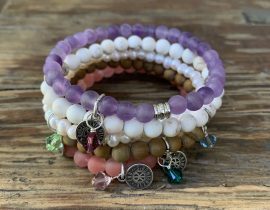 Each stretch bracelet is unique with subtle variations in color, texture and size of the gemstone beads. 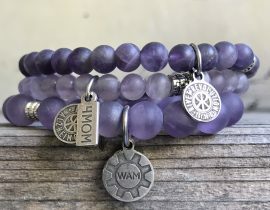 10% of the sale from every WAM Revolution Band will be donated to the Women’s Alzheimer’s Movement to help answer the question of why women are disproportionately affected by Alzheimer’s. 10% of the sale from every combo sold will be donated to the fight to end Alzheimer’s through our partner charities. 10% of the sale from every trio will be donated to the fight to end Alzheimer’s through our partner charities. 10% of the sale from every combo will be donated to the fight to end Alzheimer’s through our partner charities. © 2018 Rivet Revolution®. All Rights Reserved.